My colleagues at Purdue recently compiled weather data to determine how many hours would be available to apply the new dicamba products (e.g. Xtendimax with VaporGrip Technology, FeXapan with VaporGrip Technology, and Engenia) postemergence in soybean. Several people asked what the data would look like for Iowa, and as they say, give the people what they want. Rather than look at the entire spray season, I evaluated a single week since that is a typical window available to spray a specific cohort of weeds within the appropriate weed size. I assumed the applicator would be willing to spray from 5:00 AM to 11:00 PM. I began by eliminating hours where the wind speed was less than 3 MPH, as temperature inversions are more likely during that timeframe. The Vapor Grip products prohibit application when wind is less than 3 MPH, whereas Engenia states to determine whether an inversion is present if wind is less than 3 MPH. I classified hours where average wind speed was between 3 and 10 MPH as optimum, and hours when average wind speed was between 10 and 15 MPH as caution. I also recorded daily rainfall amounts and days when high temperatures exceeded 85F. The new labels specify not to apply the product if rain is expected within 24 hours (Xtendimax, Fexapan) or 4 hours (Engenia). While the labels do not restrict applications based on temperature, the potential for volatilization increases with higher temperatures, and 85 F is often used as a threshold. 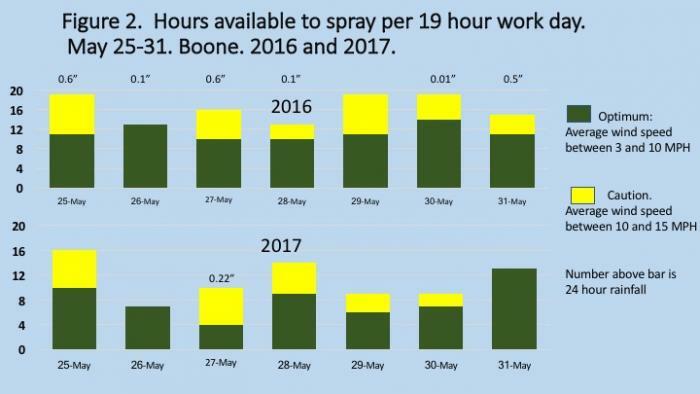 Figure 1 shows hours available to spray at the ISU Research Farm near Boone during the last week of May and third week of June. Average wind speeds tend to decrease as the growing season progresses, and more hours were available to spray in June than May. 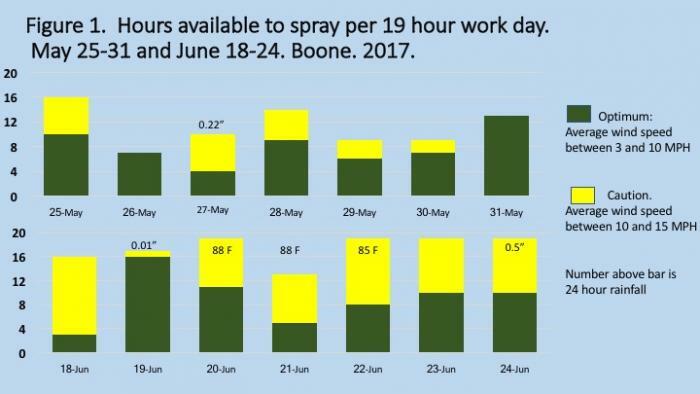 In May, there were slightly fewer than 8 hours per day to spray with optimum wind speeds compared to 9 hours in June. As the label restricts applications prior to rainfall, one day during this week in May and two in June would have been eliminated. Temperatures exceeded 85F during three days in the 3rd week of June. Graphs for two other locations in Iowa were similar to the Boone site. As everyone knows, weather is highly variable from year to year. I compared weather data from the same location in Boone during May 25-31 for 2016 and 2017 (Figure 2). Wind speeds were lower in 2016 compared to 2017, resulting in over 11 hours per day with optimal weed speed versus less than 8 in 2017. However, measurable rain occurred during six of the seven days in 2016. Due to the low rainfall amounts, most fields would be fit for sprayers to operate for significant time periods. However, if applicators were following the rain restriction on the Xtendimax or FeXapan label, applications would be prohibited almost the entire week. Most herbicide labels have statements regarding rain-free periods following application, but these generally warn that rain may reduce product efficacy rather than prohibit applications as with the new dicamba labels. The peak application window for using dicamba to manage waterhemp in Iowa soybean will be early to mid-June for most Iowa soybean fields. Wind speed tends to decrease as the growing season progresses, so wind speeds are not likely to greatly restrict application windows for most locations across the state. However, the prohibition of applications when rain is forecast is difficult to manage since it can eliminate large blocks of time for spraying. This wasn’t an issue during 2017 for much of the state, but the data from 2016 illustrates how rain could restrict operations. The rain restriction will hinder completing dicamba applications in a timely fashion during years experiencing extended wet periods during peak application periods.